The inability to get a burger and fries here has been getting to me. One previous attempt was made at it but our ingredients aren’t really conducive to either of those. I decided the next best option was BBQ beef and chicken sandwiches with tater tots. The problem comes when you have to make everything from scratch. The result was that I spent the better part of 11 hours cooking today (plus an hour or two last night). It was totally worth it. 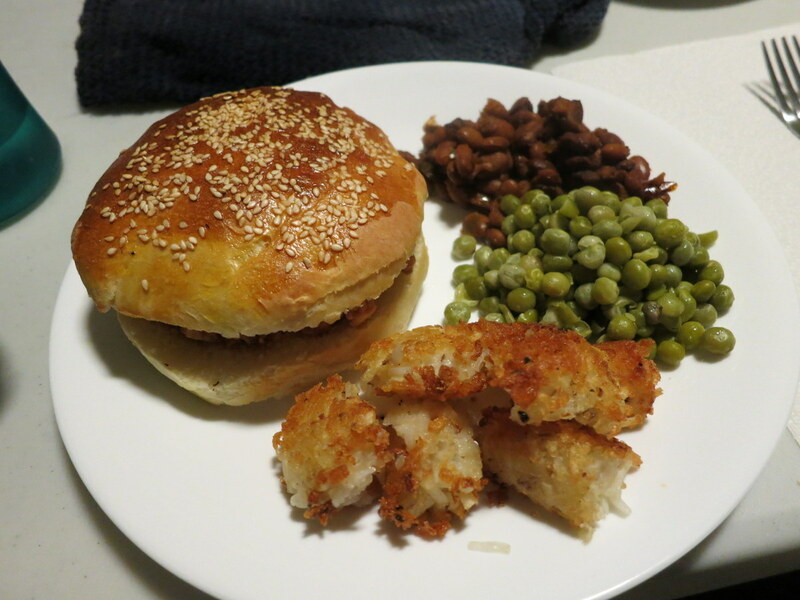 I made sandwich buns (both regular and gluten free), BBQ sauce, baked beans and tater tots all from scratch. None of these I’d ever attempted before. The peas were a concession; seemed like I should probably have something green and I wanted a backup if one of my other sides failed entirely. Did you also ask any of your crewmates if they would like to supersize that? Amazing! That bun looks storebought! Perfectly arranged sesame seeds! I hope it satisfied your tastebuds as well as your interest in replicating the food memory/obsession. Kudos Zak!